A highlight of the spring garden, amaryllis produces big, beautiful blossoms that transform a garden bed. For transplanted northerners who miss the bounty of spring flowering bulbs, this plant is the perfect answer. Flowers can grow as much as 6 inches across and usually begin to appear in March, with several large trumpet-shaped blooms opening in succession on a single stalk. 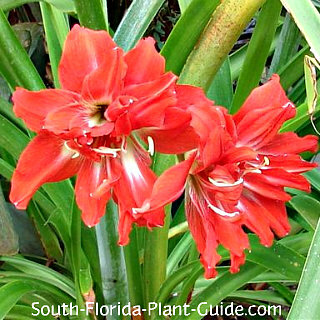 Bright red, pink, orange (and, less often, white) are typical bloom colors in South Florida landscapes. But there are hundreds of cultivars with more exotic flower colors that can be ordered from bulb companies if your plant nursery only carries the standard ones. The more unusual the flower, the higher the price...but, since these plants multiply, your money will be well spent. One large bulb can produce hundreds more over time. Growing amaryllis in groups has the most landscape impact...when 10 or more go into bloom, the sight is spectacular. The flowers only last a few weeks...but these spring flowering plants have thick leaves that grow in clumps of glossy green, and make an attractive foliage plant for borders or accents the rest of the year. Part sun to part shade works best, producing the most blossoms (too much shade and the plant won't flower). This is an easy care plant - it doesn't like to be fussed over. It's usually available in bulb or plant form. 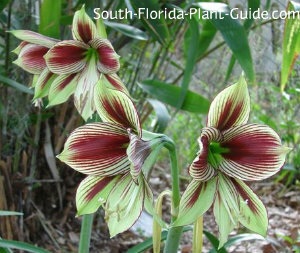 These plants do well anywhere in South Florida, growing about 2 feet tall overall (flower stalks can add another 8 to 12 inches of height). 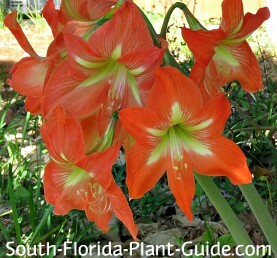 Amaryllis will multiply, growing new bulbs that can be dug up and separated if you like. Add top soil or organic peat humus to the planting area. Place the bulb in the ground with the tip at or just below the soil level. You can work some bone meal into the planting hole before placing the bulb in it. Unless you're planting in a row to line a walk or create a garden border, place bulbs in more of a non-pattern to create a nature-did-it look. You can thin out a bed of amaryllis from time to time, and dig up plants that are growing where you don't want them. This is best done in late summer or early autumn when the plant is in a near-dormant state. 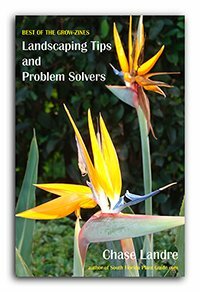 No trimming is needed other than to remove spent flower stalks (or a yellowed leaf now and then). If you cut back the dying flower stalks, the plant will send energy back into the bulb to promote more blooms the following year, rather than going to seed. If hit by frost, the leaves may die back but new growth should sprout back up when warmer weather arrives. Water on a regular basis but don't overdo it. These plants like to dry out a bit between waterings. Fertilize 3 times a year - in spring, summer, and autumn - with a quality granular fertilizer low in nitrogen. 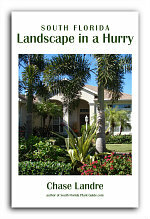 As the flowers begin to form in spring, apply 20-20-20 liquid fertilizer. Bulbs should be spaced 10 to 12 inches apart. Place sprouted plants about a foot apart. Come out from the house 1-1/2 to 2 feet. Come in from walks and dives 2 feet. These make wonderful container plants, though with their brief period of bloom it may be better to tuck them into your landscaping. 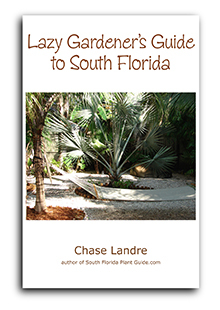 COMPANION PLANT SUGGESTIONS: Cordyline, gardenia, croton, dwarf azalea, wild coffee, alocasia, and pentas.